Although peaches are naturally sweet and perfect in desserts, they are also delicious in savory dishes. Take for example these mini flat bread pizzas; the combination of salty ham and sweet caramelized peaches is to die for. Can't easily find some of the ingredients, don't let that deter you from trying this. You can always substitute prosciutto for the Serrano ham and mozzarella for the burrata without sacrificing flavor. Drizzle a baking sheet with oil. Lay the ham on top in a single layer and bake until crispy, 10 to 12 minutes, flipping halfway. Remove and let cool. Divide pizza dough into individual balls. Sprinkle flour on your workspace and roll each ball into an elongated flatbread shape. Brush both sides with olive oil. Melt the butter in a saucepan over medium-high heat and saute the peaches with the brown sugar and some salt and pepper until caramelized, 3 to 4 minutes. Grill 1 oiled crust until it has distinguished grill marks, about 2 minutes. 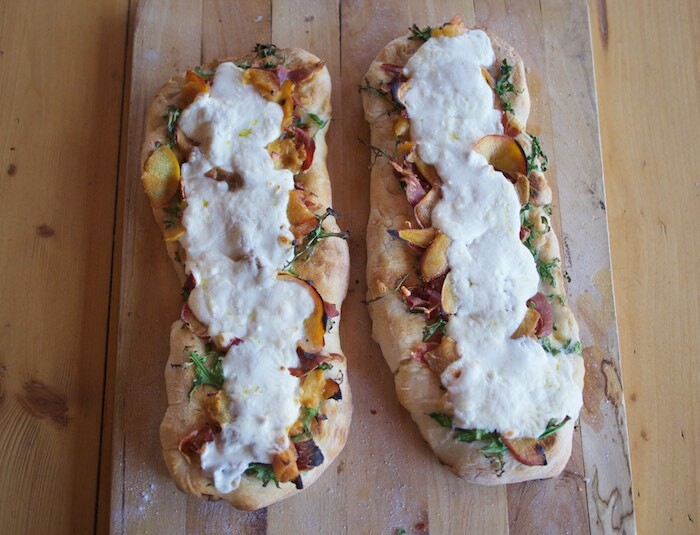 Flip and then layer with arugula, generous spoonfuls of the burrata, some caramelized peaches and crisp Serrano. Sprinkle with salt and pepper and close the grill until the cheese is melted. Remove from the grill. Oh myI Beautiful! I am also working on a peach flat bread. Great minds...Love it! Hmmmm. Peaches on pizza? That's a new one on me. LOL Sounds very interesting! Wow, I really want to try this! If only I could eat gluten... and dairy... and sugar... This. looks. so. good. WOW. I love peaches. and well.. all the other ingredients..
Have an issue finding Burrata. sadly.. I am quite seriously loving this! all the ingredients work so well together.